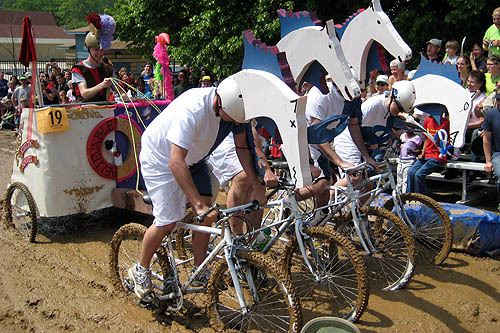 Baltimore Kinetic Sculpture Race: 2008 Race Report: It’s Ben-Hur, Hon! 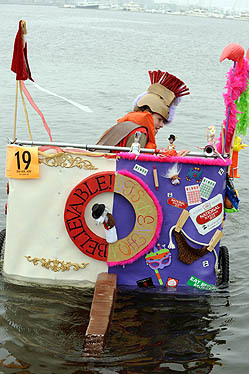 2008 Race Report: It’s Ben-Hur, Hon! When you look from the right side, It’s Ben-Hur, Hon! is a chariot from Ben-Hur. From the left it’s modern Bal’mer. On the right, the barnacle chariot-rider’s hat is a Roman legion helmet (using a red floor brush), and from the left he has a beehive hairdo straight from Hairspray. 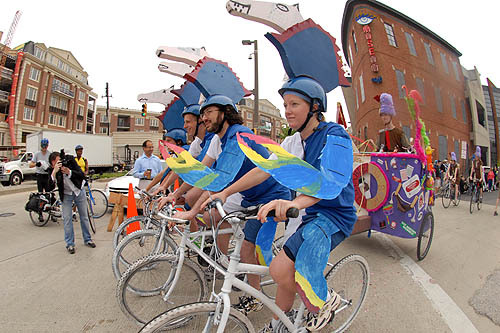 This team built last year’s Acme Kinetic Sculpture featuring Wile E. Coyote in just 3 weeks. Captain Paul Seiffert leads pilots Beth Venderhoff, Jason Williams, Dave Gray, and Alan Schittman. They started working on this sculpture just before the death of Ben Hur star Charlton Heston. Their hand-crank propeller was surprisingly effective in the water. 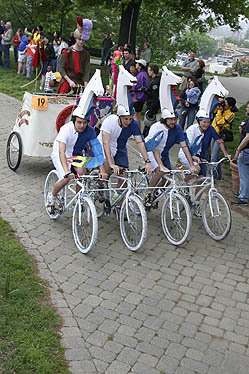 They won Pilots’ Choice, selected as the favorite by the other racers.